While working with parent-run, youth sports boards of directors, I have noticed one specific difference between them and my other clients—longevity. Board members at hospitals, social service agencies, symphonies, museums, and places of worship have long-standing volunteer careers of board service. They advance from worker bee to positions of leadership strengthening or expanding their missions and programs for generations to come. In the example of a typical high school booster club volunteer, however, service is most likely only for the four years of his or her child’s high school career. If parents have more than one child involved in the sport, they might be retained slightly longer. While many clubs are fortunate to find a great coach to develop a successful team on the field, they seem to develop at a snail’s pace administratively. Developing community relationships (especially for things such as fundraising and media coverage) is a slow, calculated process that is not served well by constant turnover in leadership positions. A coach would never leave the future of the team to fate alone. The forward thinking coach is well aware of the talent being developed in junior high and youth programs that feed into the high school program. Recognizing raw talent, placing a player in the position that best serves the team, and building trust through consistency will help grow a championship team. This rings true for the board of directors as well. In this post, two vital board positions are addressed—President and Fundraising Chair. An organization has the ability through its by-laws to set several rules of the game that can lead to administrative strength. Through the naming of board and committee positions and term lengths, the stage can be set to build stronger, more consistent relationships in the community in order to fulfill the mission. A board of directors that includes a President and Vice-President could restructure the board for the mentoring relationship of President and President-Elect. Using the high school example, a previous youth club board member exhibiting great interest and dedication during freshman year might serve well as President-Elect during sophomore year and easily take over as President for junior and senior years. During the mentoring year(s), the President-Elect will have the opportunity to be introduced to and begin working with school administrators and community leaders as well as gain the respect of other board members and volunteers. Insisting that the President-Elect has full access to shadow the President in all duties and authority to act in his or her stead helps maintain organizational memory and consistency over the years. I believe the same concept is even more important in fundraising endeavors. Donors sometimes have the same “timing” as volunteers—as their kids graduate and move on, so does their financial support requiring rebuilding of the donor base from scratch every few seasons. Building a community-minded platform of donors interested in supporting the team versus their children’s current interest requires a long-term strategic plan. That plan needs to be developed, managed, nurtured, redeveloped, and strengthened by a solid team that has garnered recognition and trust in the community. Fundraising is not for the faint-hearted. The fundraising corps must be chosen carefully and recruited from volunteers that recognize that fundraising is more of a volunteer “career” choice than in any other area. While fundraising is a requirement of every member of the board, success might be found in a strong leadership team of at least three—a Fundraising Chair with two lieutenants of various lengths of tenure. Again, the purpose is two-fold: 1) for mentoring and training as to the history, needs, and growth of the organization; and 2) to introduce future Chairs to donors for the purpose of consistency and building trust. When the time comes for the Fundraising Chair to retire, there will be a greater level of comfort and confidence for both the new Chair and the donor when the next solicitation phone call or meeting takes place between previously introduced colleagues. The team relies on the countless worker bee hours of dedicated volunteers for the concessions stand, tournaments, the end-of-season banquet, and more. But, board members must also remember that they carry responsibility for the growth and maintenance of the living entity that is the non-profit corporation that is the team or booster club. Leaders must recognize the seriousness of management of the organization and stewardship of donor’s money and community trust. I appreciate the dedication of everyone serving youth sports clubs at all levels and recognize the amount of time individuals spend growing their clubs. However, I invite all board members to reexamine their current roles on the board. Making the commitment to a non-profit volunteer career rather than a few years of “helping out” can be challenging and rewarding. Dedicate yourself not to the team that your child plays for today, but to the team that is a vital part of your school and community for years to come. 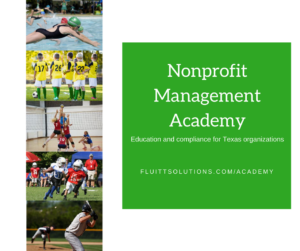 Learn more about the Nonprofit Management Academy and register today!